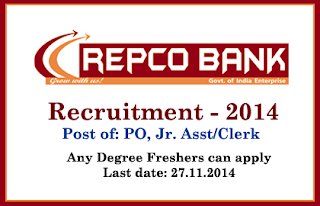 Recpo Bank announced opening for the post of PO, and Junior Assistant/ Clerk. 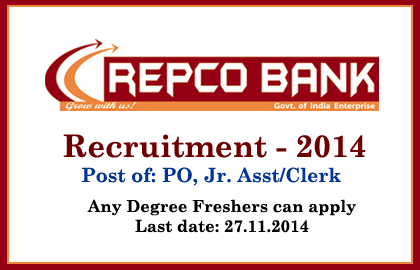 Eligible candidates can apply here on or before 27.11.2014. More details regarding this recruitment were mentioned below. Selection Process: Candidates applying for PO post will be selected on the basis of the online test, group discussion and interview. For Junior Assistant/Clerk post, they will consider the online test and interview. Candidates need to fill the online registration form at the end of that registration; you will be directed to the online payment portal. Your payment can be done using debit cards, net banking, IMPS or credit cards. After completing the online registration and payment, upload your latest photograph and signature scan.